The City of Atlanta Department of Watershed Management currently operates an aged water supply system, some of which dates back to the early 1890’s. The system is at or will reach its recommended useful life. The City of Atlanta acquired the Bellwood Quarry in 2006 to create a raw water storage reservoir with the volume of approximately 2.4 billion gallons. The proposed facility footprint area is approximately 76 acres and includes the reservoir water surface area, a security and safety buffer area and access-road right of way. The Water Supply Program Project will consist of converting the Bellwood Quarry into a water supply reservoir. This will significantly increase the water supply available to the City of Atlanta. 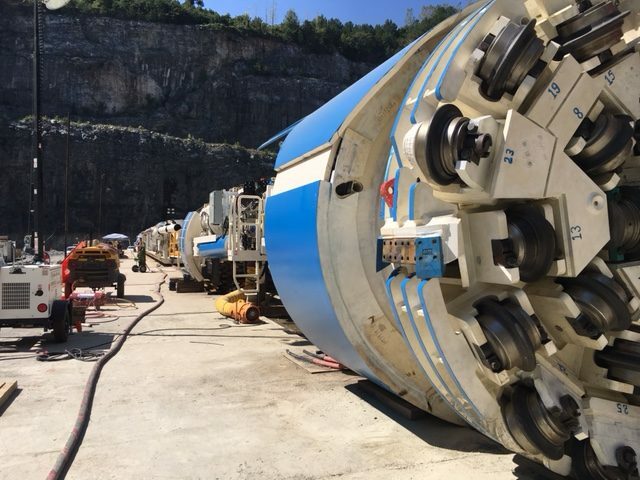 The project components will consist of a deep hard rock tunnel, 12.5 feet in diameter and 1.5-mile in length, to convey raw water from the Hemphill Water Treatment Plant to the Bellwood Quarry and back to the Hemphill Water Treatment Plant for treatment. The contract will also includes pump stations and other associated facilities at the Bellwood Quarry and Hemphill Water Treatment Plant. Furthermore, work at the Chattahoochee Water Treatment Plant, which is directly adjacent to the Chattahoochee River, is focused on upgrades to pumping equipment currently supplying water to the Hemphill Water Treatment Plant from the river through exiting piping. Russell, with joint venture partner PC Construction, is providing Construction Manager at Risk services for this project. The tunnel, bored 300 feet below ground surface, will deliver water from the Chattahoochee River for purification at the Hemphill Water Treatment Facility. The project, awarded by the City of Atlanta’s Watershed Department, includes building two pump stations and retrofitting pumps at the Chattahoochee River Pump Station.